So says one of Dr M’s MSc Plant Diversity students, and, well she’s right of course! It is fast becoming a key tool of the eXtreme botanists trade. And so it’s intriguing that, despite Dr M’s huge and much publicised admiration for the veg key, some of his students take a while to befriend this volume. The veg key is not the most robust of publications and so a good indicator is the condition of the volume. If a student turns up with a pristine copy – the friendship has clearly not got off to much of a start and it’s unused! Equally, the student with a dog-eared, tatty copy, amateurishly rebound with parcel tape (like Dr M’s left) clearly has a well-thumbed and trusty friend! So with this in mind, Dr M is encouraging his MSc Plant Diversity and MSc SISS students at University of Reading to embrace and befriend the veg key in his botany classes. Well, the first task is to understand how the “Key to Major Divisions” works. Most keys have this kind of general or master key at the very front of the book to separate plants into different major groupings. 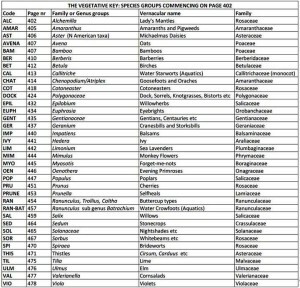 Now, in most taxonomic keys (e.g. the Book of Stace, where it is called the “General Key”) this separates plants largely using floral characters, into families: Asteraceae, Fabaceae, Apiaceae etc etc. Not so the veg key! 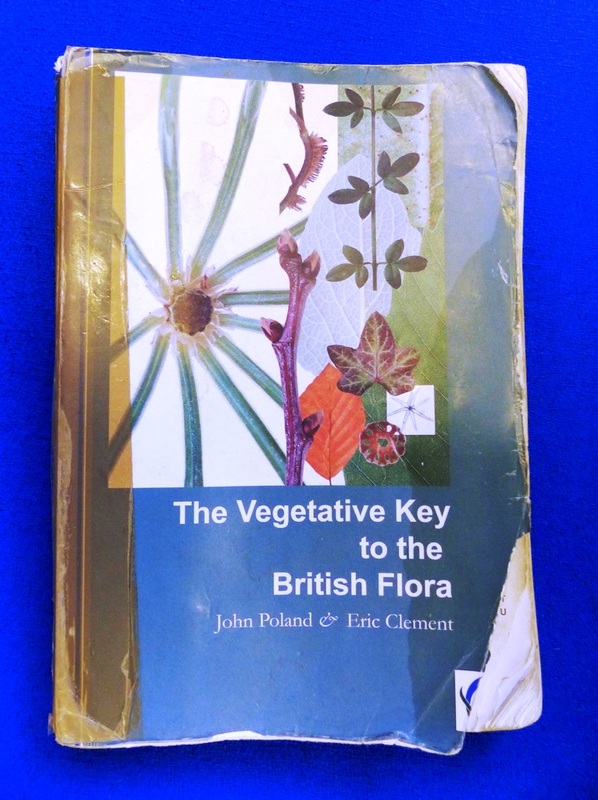 Instead, the “Key to Major Divisions” takes the main vegetative unit of plants, the leaf, and separates the British flora into “families” of leaves and these “leaf families” do not necessarily accord with taxonomic families. So how to separate “leaf families”? 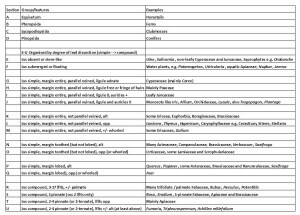 Well the most obvious classification of leaves is into simple (undivided) or compound (divided into leaflets) leaves and this is used in the veg key, as are other features such as alternate or opposite leaves, presence of lobes or teeth, ligules and auricles, parallel or pinnate venation etc. There are 21 sections in the “Key to Major Divisions” and these are given the letters A-U, and each one defines a unique type of leaf form. Actually the first four groups A-D separate out four characteristic plant groups: A – Horsetails, B – Ferns, C – Clubmosses and D – Conifers. The the next group E, is plants without leaves (e.g. saprophytes like Orobanche the Broomrapes) or stem-like (as in some Rushes). Section F is for plants with floating or submerged leaves, i.e. 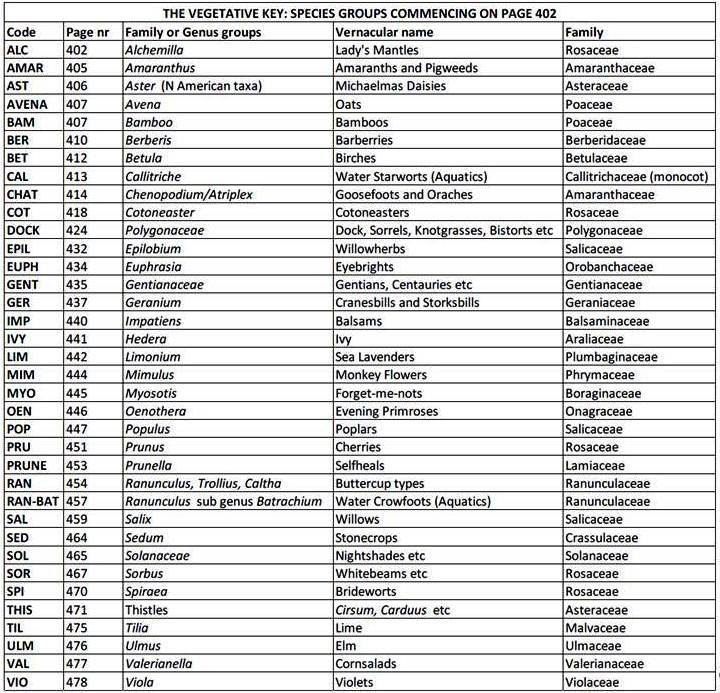 aquatic plants – quite a useful one this, and if you want to ID a water plant in the veg key, proceed straight to Group F, do not pass “Go”, do not collect £200! Then the classification of leaves starts proper with simple leaves in groups G-Q and compound leaves in R-U. 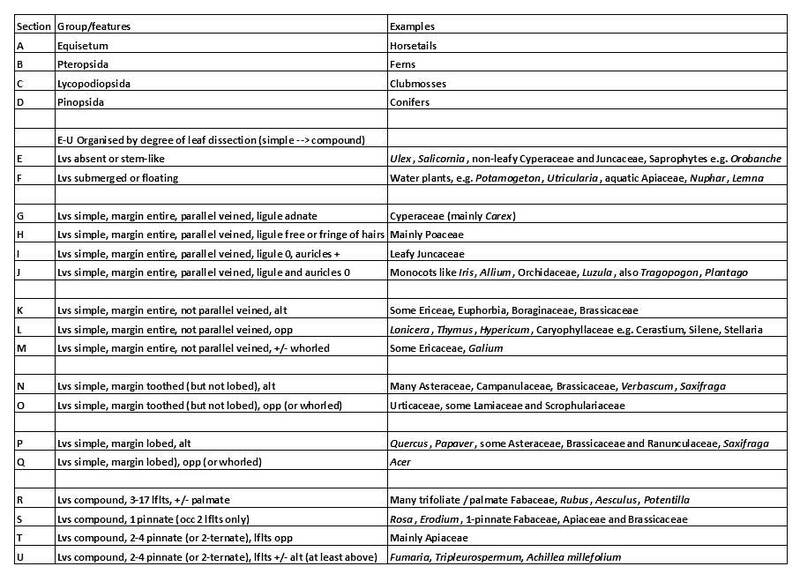 Now, although Dr M said the veg key doesn’t divide plants on the basis of taxonomic families, he lied a little! 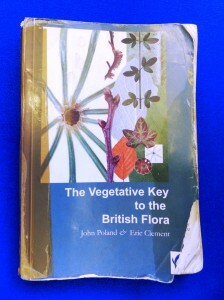 For example, one family, the Apiaceae, has very characteristic leaves which are usually pinnate or ternate with a sheathing base and so most Apiaceae key out in section T.
Then, towards the end of the volume, the veg key actually dissolves into a veritable frenzy of family and genera groupings with no fewer than 36 separate keys which allow you to key out families such as Amaranthaceae and Polygonaceae or genera such as Geranium and Myosotis. Dr M says: Embrace the veg key! Get to know it intimately and you will find a great big personality, a penchant for vegetative detail as well as some little idiosyncrasies (not to mention the odd error or ambiguity – nobody’s perfect after all!). But the little imperfections as well as a trusty reliability make the veg key a true botanical friend indeed, warts and all! Next time: Dr M will explain the mysteries of polychotamous keys and how to delve deeper into the groups A-U to identify your plant in less than 3 page turns as claimed by the authors in the publishers blurb! Is there a good reference guide to the botanical terms used in the Vegetative Key (which contains illustrations)? I am trying to use it, but I find it hard to understand some of the complex terminology used in the key, as it is a big step up from using the Wildflower Key? Tim, I think it’s the different format as well as the terminology which can make the veg key tricky for the newcomer. 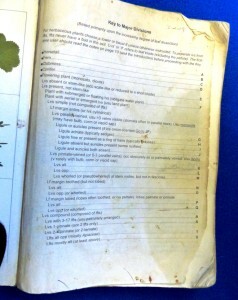 There is a glossary in the veg key but you will find the Kew Plant Glossary very valuable for this and all keys. It’s not expensive (about £15) and you can find good deals and second hand copies online. Thanks! l’ll try to pick up a copy.